When Desiree Verdejo, 33, couldn’t find a place that addressed her hair care, skin care and makeup needs, she did what any entrepreneur would do: She created one. Enter Vivrant Beauty—a luxury destination in New York City that puts women of color first. 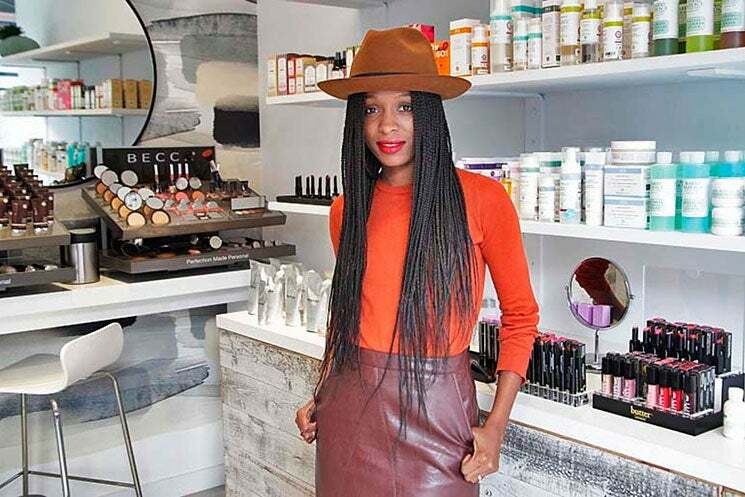 ESSENCE: How did you go from working as a lawyer to opening Vivrant Beauty? Desiree Verdejo: I was a corporate attorney for seven years. While living in Harlem, I looked around and realized that there really was no beauty retailer that catered to women of color. There are beautiful brands for this market, whether it’s a company that considers our skin tones or our hair texture, but I couldn’t find anyone offering these products in a way that I felt was deserving. So I set out to create an atmosphere that filled the void. ESSENCE: Has beauty always been your passion? Verdejo: Yes! Aside from spending way too much money on products, I started a beauty blog years ago to explore different brands and retailers and to test the effectiveness of different products. I found myself spending my downtime reading up on the industry and going to natural hair meet-ups, where I could talk to the women behind some of my favorite items. ESSENCE: Going from blogging about beauty to owning a business is a big leap. Walk us through your process. Verdejo: It took a year to really convince myself that it was time and that I was ready. On January 1, 2015, I decided that I would have to open the store that year. By that point, it had been an idea in the back of my head for a long time. I said to myself, You’re either going to do the law thing or you’re going to start this business, but you can’t live in this middle ground. As anyone can imagine, if you’re writing business plans, researching products and doing all the work that it would take to launch a store, you’re probably not doing your real job so well. So on the first day of the year, I said, One of these things needs to be done and done well. From that day on, I made Vivrant my job. I started treating it as if it were going to happen, even though I wasn’t ready. When I quit my job—two weeks before the store opened in July 2015—I still wasn’t ready. I don’t think there was a point where I was like, Yeah, I got this. But I knew it needed to happen, so I had to give myself a deadline. ESSENCE: What was the hardest part of getting the store and the Web site off the ground? Verdejo: Convincing brands that I, as an attorney, could represent their product was a hard sell before we opened. Instead of trying to convince tons of people, I picked a handful and really focused on getting in front of them and introducing myself and my plan. Once they were on board, it was easier to persuade other people, because I was able to say, “This shop will feature these premium products.” In the end, we launched with 30 brands, including Black-owned nail lacquer line Mischo Beauty and hair care line Briogeo. ESSENCE: All retailers experience slow days, weeks, even months. How do you handle that? Verdejo: Last January was a slow month. I think a slow sales day will bring down any retail business owner, no matter what other amazing thing happens at that same time. That said, slow periods make you very creative. Some of our best concepts—like, “Oh, we should have this event” or “We should invite this blogger into our shop”—happened last January. ESSENCE: What motivates you to keep growing? Verdejo: I love when I see comments on social media like, “Oh, my god, I wish this existed in my city” or “I’m glad I can now buy my favorite skin care line and my favorite conditioner in the same place, and don’t have to make three stops.” I spent years working intensely for someone else’s vision—which makes it so much easier to do it for mine.